Why Would You Need A Red Dot Magnifier? Red dot sights have been growing in popularity, but even if they offer many advantages over the iron sights, they still lack an important quality. They don’t increase your shooting range. This is where the red dot magnifiers come into play. These magnifiers are devices you place behind the scope to increase your range and improve your accuracy. In the following article, we present the best red dot magnifier models you can buy today, and we explain why you should use one. Later, in the article, we present how each of the magnifier’s characteristics influences your shooting, and how to chose the right model for your needs. 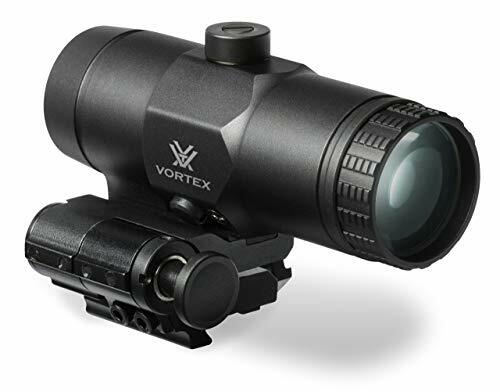 The Vortex VMX-3T is one of the best red dot magnifiers that are currently available on the market. This model is very user-friendly, and it’s easy to install and use. Thanks to the flip mount it uses, this magnifier will allow you to switch between close-quarter shooting and mid to long-range shooting in an instant. One of the advantages of using this red dot magnifier is that it doesn’t take up too much space on your Picatinny or Weaver rails. This unit is resilient, and it will handle itself well in poor weather conditions. The high-quality seal rings will allow you to use the magnifier in foggy or rain conditions with good results. The magnifier’s casing is made out of high-grade anodized aluminum, and it will withstand the usual wear and tear without any difficulties or permanent marks. Another good thing about this model is that it uses a good lens system. This system will make the red light very crisp and clear when you’re using the magnifier, allowing you to shoot mid to long-range shots with good accuracy. 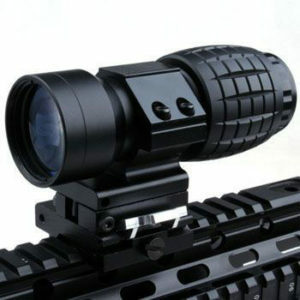 Overall, this is a great red dot magnifier that comes at a good price and offers a high value. The UTG 3x red dot magnifier is one of the best choices for shooters who are looking for a magnifier but have a limited budget. Despite its low price, this model is capable of enhancing your red dot and providing a clear and crisp image while doing it. One of the advantages of using this model is that it comes with a flip over the mount. This will allow you to transition from close-range to mid-range shooting in the blink of an eye, and it will not interfere with your movement when you’re not using it. Another good thing about this red dot magnifier is that it comes with fully coated lenses that will allow you to use it in every type of weather conditions. The lenses will produce a high-quality image, allowing you to shoot accurately at mid to long distance targets. All things considered, this product is able to deliver good results, despite its low price. This makes it a high-value item you shouldn’t miss if you’re looking to save some cash. 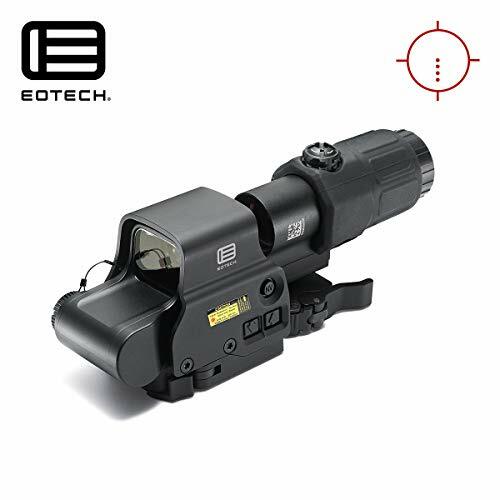 The EOTech HH1 is a high-quality red dot & magnifier combo that comes with a switch to side mount and night vision compatibility. While this combo does come at a price, the quality and design make it worth it and then some. The ballistic reticle of the red dot sight is specific to the .223 caliber munition, and it comes with a 7 mm raised base that will offer iron sight access. One of the great things about this combo system is that it’s easy to install and adjust, and it’s extremely efficient. A good thing about this combo build is that it’s very easy to use. Once you install the system, you won’t have any problems zeroing it in, and using it will be a breeze. The side mount allows you to transition from close-quarter shooting to long-range within moments, and the combo is reliable for shooting within 500 meters or more. This combo is also night-vision compatible, so you can use it with good results in any type of light conditions. The sight’s reticle is very clear and versatile, and you will be able to group your shots over long distances without too much trouble. All in all, this is one of the best red dot & magnifier combos available on the market today, and it works great as a combo and individual devices at the same time. The Hammers magnifier scope is another budget solution for shooters who are considering investing in a red dot magnifier. However, despite its low price, this is a very competent model, and it can be used reliably for a long time. One of the advantages of using the Hammer magnifier is that it comes with fully coated lenses that produce a high-quality image when you enhance the red dot sight. The clear reticle will allow you to acquire your targets and make accurate shots at mid to long-ranges. Thanks to the coated lenses, this model is efficient in low light shooting conditions. While you won’t be able to use the magnifier in complete darkness, using it at dusk or dawn will not present any problems. You can adjust the magnifier’s windage and elevation without changing the red dot’s zero, and switching from close-range to mid-range targets shouldn’t be an issue if you mount the magnifier correctly. This model doesn’t come with a mount, so you will have to purchase one separately. Considering this unit’s build and design, you will be able to get the best results if you buy a flip mount that can change its position quickly. 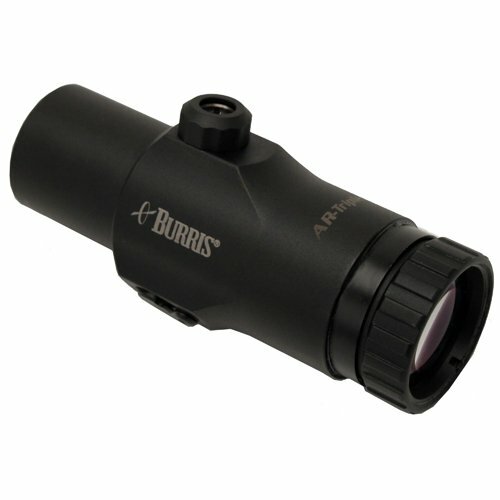 The Burris red dot magnifier is a high-quality tool that has a decent price. This unit comes with a quick-detach pivot ring that will allow you to switch between close-quarter and mid-quarter shooting quickly. The pivot ring is easy to install, and it will take up two slots of your Picatinny rail. One of the good things about this model is that it uses high-quality lenses. The lenses are fully coated, and they will provide a clear and crisp view of the reticle in all types of light conditions. This model comes with a durable case that will protect the lenses from the usual wear and tear combat or shooting scenarios puts you through. The pivot ring is easy to use, and you can flip it on the side of the weapon in a matter of moments. When you engage the magnifier, the pivot ring locks into position, and it will keep the unit steady as you shoot. Furthermore, this model comes with a limited lifetime warranty, so you can rest assured that you will be able to use it for a very long time. Overall, this is a great red dot magnifier that comes at a decent price. 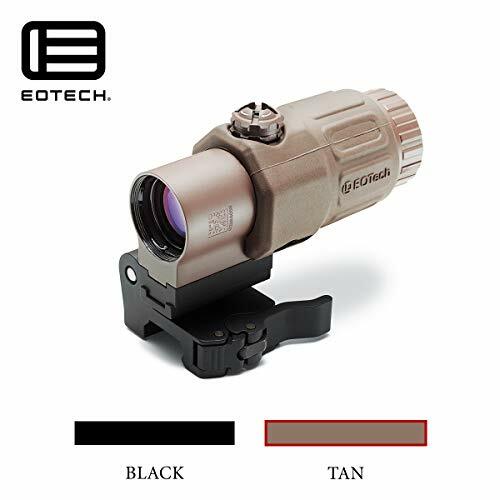 The EOTech G33 provides a good magnifying solution for shooters who want to be able to use their red dot sights for both close-quarter and mid-range shooting situations. One of the best things this model has to offer is the highly reliable and easy to use switch to side mount. Not only is the mount installation of your Weaver or Picatinny rail easy, but it’s also very easy to engage. When you want to use the red dot sight without the magnifier, you can simply push it out of the way with the palm of your hand. 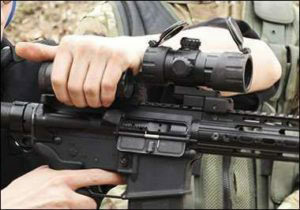 When you want to use the magnifier, you can push it back and it will lock securely in place before you start shooting. Another good thing about this model is that it offers an adjustable diopter and a large field of view that will improve your focusing and shooting precision. Thanks to the large field of view, your eyes will adjust quickly when you transition from the red dot sight to the magnifier, and you will be able to make accurate shots at medium-range distances. All things considered, this is a high-quality red dot magnifier that’s well worth its price. 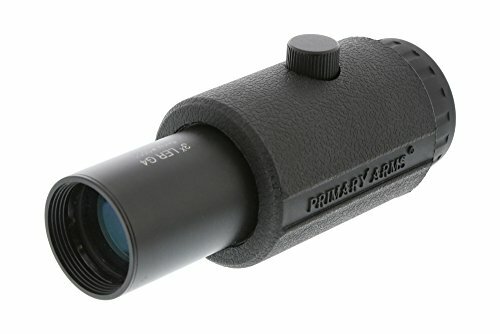 The Primary Arms red dot magnifier is a capable model that can produce very good results, especially if you take its decent price into consideration. Despite its low price, this model offers a lot of useful features, and it’s very efficient. A great thing about this model is that it comes with a high-quality casing. The casing is very durable, and it’s covered with a rubber surface that will further protect the lens system from impacts. Another good thing about this model is that it offers a long eye relief, and you will be able to transition from the red to sight to the magnified image of the reticle without any problems. This unit’s optics system also offers a wide field of view, so you will be able to acquire your targets and aim with ease. This unit produces a clear and crisp image of the reticle, so you will be able to acquire mid-range targets with good precision. You can adjust the windage and elevation to keep the red dot in the middle of your field of view, so you can always make accurate shots. Even though this model doesn’t come with a flip mount, the manufacturer produces some units that are compatible with it. All in all, this is a very good model, especially if you factor in its low price. You might be wondering why you should get a red dot magnifier in the first place. Sure, everybody likes to accessorize their rifles, but is a magnifier really an important accessory? Well, that basically depends on how you’re using your rifle. Red dot sights were designed to replace the classic iron sights everyone used before them. But even though the red dot sights offer a lot of advantages over the iron sights, such as quicker target acquisition, improved aiming, and flawless transition from one target to another, they don’t improve the iron sights’ range. So even though you might spend tens or hundreds of dollars on a red dot sight, you will still be able to use it only for close range shooting. That’s where the magnifiers come in handy. The magnifiers are placed behind the red dot and they offer a 3x magnification. Even though this might not seem like a very big deal (3x is really not an impressive magnification, considering most good quality AR scopes now provide a 12x magnification or more) it will definitely make the difference in your mid-range shooting accuracy. Now, if you’re really thinking about reasons to buy a red dot magnifier, think of it this way. These units make the difference between spotting the bad guy when he’s at 500 feet away or spotting him when he’s at a distance of 1,500 feet. It really puts things into perspective, doesn’t it? Even though red dot sights are used by a lot of shooters, many people don’t really know what to look for in a magnifier. In the following section, we explain how each of the magnifier’s characteristics will influence your shooting experience, and we will hopefully shed some light on how to choose the best red dot magnifier for your needs. Since you’re looking for a device that can magnify the power of your red dot sight, it’s safe to say that the unit’s magnification power should be the first thing you look for when deciding on a model. 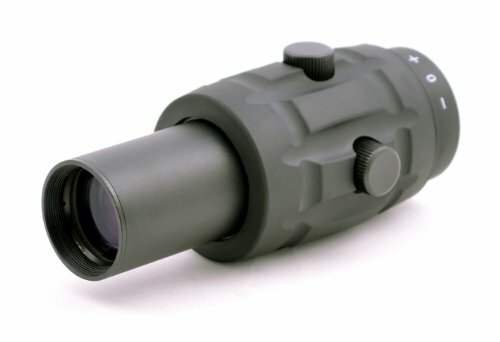 Now, most units offer a 2x or 3x fixed magnification, but there are some models available on the market that offer a variable magnification that can go up to 5x. Even though you might be tempted to go directly for those models since they offer a better magnification, that might not be the best idea. Unlike scopes that have a long casing that houses lenses specially designed to catch and redirect the light, red dot magnifiers are small and compact. The difference is size is relevant in this case, as the number of lenses used in a magnifier will be lower than the one used by the scopes, so less light will be redirected to illuminate the reticle. You might not notice this when you’re shooting in bright daylight, but you try to aim using a magnifier in low-light conditions, you might be surprised to notice you can’t see the reticle at all, let alone use it to acquire your target. However, the 2x – 3x magnification will allow you to make accurate shots at distances of 200 – 300 yards, which should be an improvement over what you could normally do with a simple red dot sight. One of the advantages of using a red dot magnifier over a scope is that you can switch from using the magnifier to using the red dot without it in mere moments. This will allow you to acquire your targets with ease, and it will allow you to change your aim from one target to another in quick succession. However, switching from close-quarter to mid- to long-range shooting is only possible thanks to the mounts you use to install the magnifier on your Picatinny or Weaver rail. Even though there are some fixed mounts that can be used for the magnifier, you should avoid them at all costs. Using a fixed mount for your red dot magnifier can be outright dangerous in field scenarios when you have to pick your targets at close range. It’s advisable to use a flip mount for your magnifier. This mount will allow you to quickly put the magnifier behind your red dot sight when you need magnification and set it aside when you don’t. Using the flip mount will allow you to acquire your targets quickly, whether you’re taking close-range or medium-range shots. If your magnifier doesn’t come with a flip mount, you should always check the mount’s manufacturer website or contact its customer support service to learn if the product is compatible with your red dot sight. Since the magnifier zooms in on your targets, it will certainly have eye relief. 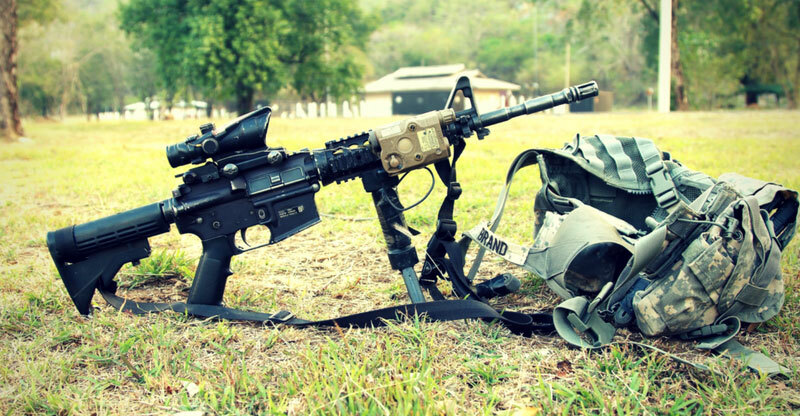 Depending on the magnifier’s zoom capacity and the rifle’s design and caliber, you will probably need several inches of eye relief to shoot comfortably. Being aware of the eye relief is also very important when you’re installing the magnifier’s mount behind the red dot sight. You might need to experiment with different positions to find the one that offers a clean and crisp image of the reticle. You might also have to adjust the magnifier’s angle by twitching its windage and elevation to make sure you center the red dot on the magnifier’s screen. 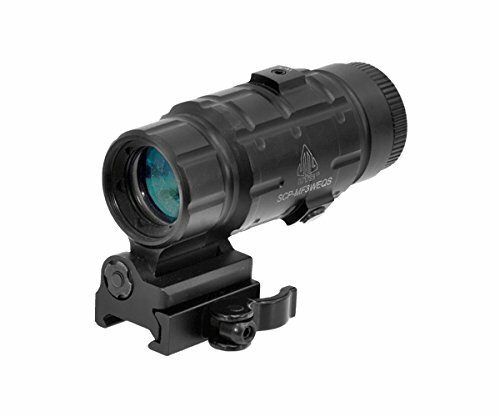 As you could see from our reviews, red dot magnifiers come at widely different prices. Some models cost tens of dollars, while others cost hundreds. So now you might be wondering, is it worth it to spend so much on a magnifier? Well, the short answer is, it might be. This is closely related to the way you’re planning on using the magnifier. Target Practice – If you plan on using the red dot magnifier for fun at the range, you shouldn’t invest a lot in a model. You will be able to find capable models at a decent price, and since they will be able to magnify your targets, they will be very good for your practice. Hunting – If you’ve been using the red dot sights on your hunting rifle or red dot for your pistols for some time now, you might have been involved in a scenario similar to this one. Your target was in shooting range, but somehow you missed with your first shot and the target ran away. You might have been able to see the target as it ran, but the red dot didn’t offer the range to shoot it down. Now imagine this scenario when using a red dot magnifier. The target runs away, exiting the sights’ range. You flip the magnifier behind the sights, triple your shooting range, take the shot and bring down the target. High-end magnifiers usually offer a better image when you’re acquiring your target from a considerable distance, so they will be more efficient when you aim at a moving one. Seems to be worth it, doesn’t it? Self-Defense – Using a red dot magnifier on your self-defense rifle is highly advisable, especially if you live in a remote location or you have a cabin in the woods that allows you to acquire your target from a considerable distance. You owning a rifle might scare the bad guys, but using a magnifier to acquire your target might stop them for good. Some red dot sight & magnifier combos such as the Eotech HHS l Red Dot & 3X Magnifier are night vision-compatible, so you will be able to use them in complete darkness. Of course, the night vision compatibility comes at a price, but it will be worth it in the end since their role is to increase your security, wouldn’t it? $$$ 3x 2.5 Inch 44 feet at 100 yards 4.0 in. Red dot magnifiers are a relatively new addition to the market, but they’ve been steadily growing in popularity over the last few years. While these units might not offer the magnification of scopes, they can still improve your accuracy when you’re taking mid-range shots. Finding the best red dot magnifier is difficult in today’s crowded market, but we hope our article shed some light on how to choose the right model for your needs. Thinking about how you’re going to use the magnifier should be an important factor in your decision, so do so before choosing a model.